There are ninety-nine counties in Iowa. The first two counties, Des Moines County and Dubuque County, were created in 1834 when Iowa was still part of the Michigan Territory. In preparation for Michigan's statehood, part of Michigan Territory was formed into Wisconsin Territory in 1836]. Two years later, the western portion was split off to become Iowa Territory. The south-eastern part of Iowa Territory became Iowa, the 29th state in the union, on 28 December 1846, by which point 44 Counties had been created. Counties continued to be created by the state government until 1857, when the last county, Humboldt County, was created. Linn County is a county located in the state of Iowa. Based on the 2010 census, the population was 211,226, making it the second-most populous county in Iowa. Linn County was created on December 21, 1837. The county seat is Cedar Rapids. Linn county is named in honor of Senator Lewis Linn of Missouri. Linn County is included in the Cedar Rapids, IA Metropolitan Statistical Area. Linn county is named for Lewis Fields Linn, an US senator from Missouri. Linn County is named for Lewis Field Linn, a doctor and an authority on Asiatic cholera. He was also a US senator from Missouri and active in creating the Wisconsin Territory. The county was established in 1837 and originated in 1839. Three men were selected to locate the county seat. They selected a site in 1839 and quite some time later named it Marion, after General Francis Marion, who was famous in the Revolutionary War. Settlers of the county cut logs and hauled them to Marion. There they constructed a log cabin courthouse, free of charge. In the spring of 1846 a frame building was constructed to replace the log cabin courthouse of 1840. It was soon replaced by a two-story brick and stone structure. Marion received continued agitation from Cedar Rapids (originally called Rapids City), over the county seat. But it was not until a November 4, 1919 election Cedar Rapids was declared the new county seat. This election was called a victory for the lawyers at the time; about 90 percent of Linn County's lawyers lived in Cedar Rapids. The construction of a courthouse in Cedar Rapids was slow going. Many legal questions had to be answered before a bond issue was finally approved in 1923. The cornerstone of the new courthouse was laid on November 12, 1923. The steel frame building sits on concrete piles and the exterior is faced with Bedford limestone. It was built on Municipal (or May's) Island, located midstream in the Cedar River, opposite the downtown business district. The island, about four blocks long and one block wide, was acquired from the city by Linn County for $7.50. Total cost of the building, including jail, was $550,639. The building was dedicated on July 6, 1925 and re-dedicated in July 1975 for its 50th anniversary. The city of Marion gained fame before the turn of the century as the home of the Cherry Sisters, well-known vaudeville performers. By 1980, Linn County government had outgrown its courthouse, and a bond issue was approved by the voters to purchase the Penick and Ford office building, at 930 1st St. SW, across from the huge corn processing plant of the same name. The offices of the Board of Supervisors, Auditor, Treasurer, Recorder, County Assessor, Building and Zoning and data processing services were moved to the remodeled Penick and Ford office building in late 1980 and early 1981. The building was named the Linn County Administrative Office Building. 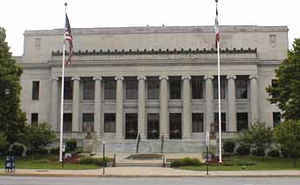 The original courthouse housed only the courts, the county attorney and the sheriff's department. Later in 1981, a bond issue was approved to construct a new jail behind the courthouse on May's Island. The original jail was torn down and the new structure was built to house the Sheriff's Department, as well as approximately 150 prisoners. The building was named the Linn County Correctional Facility. In 1998 another bond issue was approved to expand the jail capacity and to purchase the former Cedar Rapids Police Department building to remodel and hold the administrative offices of the Sheriff. The jail capacity was expanded to nearly 400 prisoners once the Sheriff's Department was moved to the remodeled police station in December of 2000. As reported by the Census Bureau, the county has a total area of 725 square miles (1,880 km2), of which 717 square miles (1,860 km2) is land and 7.6 square miles (20 km2) (1.1%) is water. Linn county is located in east Iowa. Matsell Bridge Wetlands is located in this county.